Find Orlando Homes for Sale & Orlando Real Estate Listings. Search Orlando Florida MLS to view prices, pictures and market information. Orlando Luxury Home sales are on the rise and Sterling Chase Realty features Orlando FL as one of the top 10 Luxury Real Estate markets in Central Florida. Orlando is on the cutting edge in Real Estate with new developed areas such as Dr. Phillips this Luxury lifestyle communities offer more than just a place to live. Bay Hill is the best Orlando Golf Course communities to live in. The 24hr Guard Gated community of Bay Hill offers Luxury Golf front and water front home sites and features some of the best Luxury homes for sale in Central Florida. Vizcaya is another great community and features homes directly on the chain of lakes. If pure luxury is what you are after than Dr. Phillips area is the place you want to call home. Many movie starts, pro athletes and celebrities reside in the Dr. Phillips area. 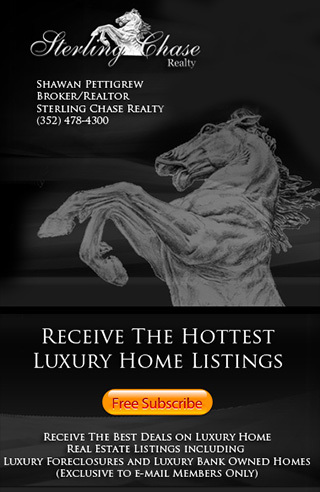 Orlando Florida is home to many Million Dollar, Multi Million Dollar, Mega Mansion and Luxury Estate Homes where Sterling Chase Realty brings them all here for you to view.